Tell us a little bit about Fetch Robotics and how you got started. Fetch Robotics was founded in August 2014. The first four employees at Fetch were all robotic industry veterans, coming from the start-up Unbounded Robotics and prior to that Willow Garage. 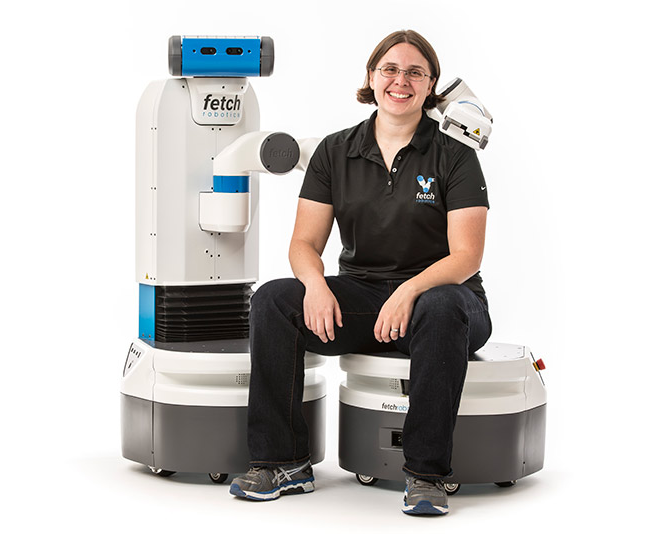 Melonee Wise, formerly the second hire at Willow Garage, took the helm as CEO of Fetch Robotics with a mission to bring a robotics solution to the logistics and warehouse industry. Wise and her colleagues were confident that the market for home robots was still far in the future, so instead looked for business needs in semi-structured environments; areas where robots and people could work side by side. With the ongoing growth in e-commerce, and further consumer demand for same-day delivery, the pressures on warehouses to deliver more products faster than ever was apparent. Wise and her team formally announced the availability of two robots in the Spring of 2015. The robots were called Fetch and Freight. Fetch is a one-armed mobile manipulation platform sold to research and academic markets. To date, approximately 50 of these units are being worked on by researchers all over the world. Fetch is an autonomous mobile robot (AMRs) platform that is used for material transportation and data collection. What factors led Fetch Robotics to decide to address the needs of the logistics industry? Warehouses and logistics facilities are struggling on two fronts: hiring and efficiency. On the hiring front, there are approximately 600,000 unfilled jobs in the logistics sector. Forward-thinking warehouses are turning to robots to help take on some of the simpler tasks and support their existing workforce. Because of the continued growth of e-commerce and consumer expectations of an on-demand economy, warehouses need to move inventory in and out of their facility faster than ever before. Increasing throughput gets to the heart of the value of Fetch’s material handling robots. Many approaches to increasing throughput through automation are quite expensive and take extensive deployment and setup time, not to mention staff training. Fetch has worked very hard to make our material handling robots not only easy for warehouse associates to operate but also for warehouse operators to set up and reconfigure with limited to no assistance from us. AMR’s also happen to be great tools for collecting data in a warehouse. Lost or misplaced inventory is a significant expense for nearly all warehouse. It’s not just the cost of the material but also the expense of people dealing with an out-of-process fix, plus the potential added cost of expedited freight. It all adds up. Tracking inventory with an RFID-enabled robot that is constantly moving around a warehouse in a fixed, predictable way delivers much more consistent and reliable data on inventory. Outline some of the most common uses for Fetch’s robots? Fetch has autonomous mobile robots (AMRs) serving two distinct markets: data collection and material transport. With respect to data collection, Fetch’s robots are also used to gather environmental data more frequently and more accurately. This includes IoT and Big Data applications. Our latest Autonomous Mobile Robot (AMR) incorporates RFID technology to help warehouses track inventory more effectively. This has traditionally been a very manual, time consuming, and underappreciated process. What are the most common concerns when logistics companies look at robotics as a solution? In general, hesitancy occurs because of a natural lack of familiarity with a collaborative robot. In the majority of cases, when a customer purchases a robot from Fetch Robotics, it is the first time they have purchased something in this category. Our customers are familiar with moving items within a warehouse via a forklift, for example, but our robots are new to them. We remind them that forklifts were once a new product as well. Safety: Unlike the traditional industrial robot industry, robots today work alongside people. There are an average of almost 100 serious injuries every day from forklifts each year. When it comes to transporting items throughout a facility, robots are a much safer option. Simplicity. Engineers can be guilty of overdoing it when it comes to technology innovation; this is particularly true of roboticists. At Fetch, we have focused diligently on making our technology simple to use and set up. Software: like the iPhone or other smart phones, the simplicity of our robots is belied by the complex software that underlies the product. While the hardware of the Fetch and Freight models is impressive, it's our FetchCore software that makes them sing. Arguably, Fetch Robotics is a software company disguised as a robotics company. Our FetchCore software makes the robots easy to configure, easy to adjust or manage, and simple to integrate with existing warehouse management systems. What kind of results are being reported back to Fetch from its customers? According to Fetch customer RK Logistics Group: “Within a few short months we saw a full ROI on our implementation, and we are able to pass the savings from this initiative on to our customers.” The ROI is derived from the increase in productivity. How is Fetch partnering with others in the logistics ecosystem? Fetch’s partnership with SAP is a good example of this kind of partnership. The combination of Fetch and SAP will enhances the efficiency at warehouses by enhancing the capabilities of SAP EWM with the ability to interact with the physical environment through the use of AMRs working alongside and helping workers to perform repetitive tasks such as goods delivery, pick and pack, and surveying. The combination of Fetch Robotics and SAP EWM application also integrates complex supply chain logistics with warehouse and distribution processes. Why do you feel partnerships so important to the industry? Our partners are very important to us, they extend our sales support reach and provide our customers with local support. While we provide the intelligent underlying mobile platform, we leave it to partners to provide that final mile of customization and/or integration that allows our robot systems to fit seamlessly into existing workflows. Looking down the road 5 or 10 years how has the logistics industry evolved and how is Fetch involved in this transformation? The pressure on logistics is greater than ever. Ten years ago warehouses delivered pallets and larger shipments. Today it’s down to the individual SKU level. Furthermore, they need to be prepared to deliver those items often on the same day. Moving more items in less time requires big leaps in efficiency. Throw in a tight labor market and you can see why Fetch is so focused on helping warehouses with these challenges. In the coming years, expect to see more and more warehouse workers comfortably working alongside their robotic colleagues. Too much of the narrative around robots in the workplace today is robots or humans, when the reality is robots and humans. By making sure these robots are efficient, safe, and simple to use Fetch will help with that transformation. Melonee Wise is the CEO of Fetch Robotics, which is delivering advanced robots for the logistics industry. The company introduced their robot system in May of 2015. Prior to joining Fetch, Melonee was CEO and co-founder of Unbounded Robotics. Before then, Melonee was Manager of Robot Development at Willow Garage, where she led a team of engineers developing next-generation robot hardware, including the PR2 and TurtleBot from Willow Garage. Melonee also has extensive experience in the growth of ROS as a research and commercial platform. Melonee was a 2015 recipient of Technology Review's TR 35 -- an award for the leading technology innovators under the age of 35. Also, she was previously a mentor in the Qualcomm Robotics Accelerator program.